On this day in history, 1842, Dr. William Brydon, who had part of his skull sheared off at the time, rode an exhausted horse into the British garrison at Jalalabad, Afghanistan. When asked where the rest of the army was, he replied “I am the army”. In fact, he wasn’t actually the sole survivor, as he thought, but was pretty close to it. The few other survivors tended to be certain high ranking officers and some of their wives who were captured and held prisoner. The 4,500 troops (700 British and 3,800 Indian) were commanded by Major-General William George Keith Elphinstone. They were accompanied by about 12,000 camp followers, made up of various craftsmen; servants; barbers; blacksmiths; etc., along with many wives and children of soldiers and the other camp followers. Along with leading this small army, Elphinstone was also noted for being one of the commanders at the Battle of Waterloo. This is where his positive accolades end though as General Elphinstone was generally considered a poor commander and was even called “the most incompetent soldier who ever became general” by one of his fellow Generals (William Nott). Initially, things went very well for Elphinstone and his troops stationed in Kabul, Afghanistan. At first, they numbered 20,000 with another 38,000 in a civilian camp. The lifestyle in Kabul for them was very luxurious and peaceful after they initially took over, despite the justified unrest among the Afghan people towards their relatively recent British conquerors. This peaceful lifestyle was purchased at a high price by the British government in India, who paid subsidies to surrounding tribes to keep them placated. The lifestyle was so peaceful that most of the troops were ordered back to India, leaving just 4,500 in Kabul with about 12,000 civilians in tow. Unfortunately for the soldiers, though, it was eventually decided that the cost of the subsidies and maintaining the small garrison in Kabul was too great, so the subsidies stopped. Shortly thereafter, a group of Afghans murdered one of the chief British political officers in Kabul, Alexander Burnes. Rather than take any action to prevent further uprising, General Elphinstone didn’t respond at all to the murder. Soon, a series of small skirmishes took place, at which point Elphinstone realized their peril and called for reinforcements from Kandahar. Unfortunately, no reinforcements were able to reach him because of heavy snow in the passes. To get around the issue, another high ranking British official decided to try to negotiate safe passage to the garrison at Jalalabad for the soldiers and 12,000 camp followers. The Afghan rebels, led by Akbar Khan, initially seemed open to such a treaty and invited the British to a meeting… where they subsequently slaughtered the British delegation directly after the British dismounted their horses. Once again, rather than respond in any way to this event, General Elphinstone chose to do more or less nothing initially. He followed this move by the genius stroke of making an agreement with the rebels which included stipulations that the British soldiers would hand over much of their gunpowder, muskets, and heavy artillery before leaving. In return for giving up much of their ability to defend themselves to the rebel troops who would then subsequently be well armed, they were to be granted safe passage to the garrison at Jalalabad some 90 miles away. Naturally, the second the main portion of Elphinstone’s army and camp followers left Kabul, they were fired on from the ramparts of the city, with their rear flank taking heavy casualties. Further, those sick and wounded who were left to follow along as soon as they could were slaughtered by the Afghans and the former army encampment was set on fire. Despite being attacked the second the troops were out of the city, rather than quicken the march to the critical pass 10 miles away, to make sure Afghans didn’t get there first and setup fortifications, Elphinstone, rather, ordered a halt after just 6 miles. 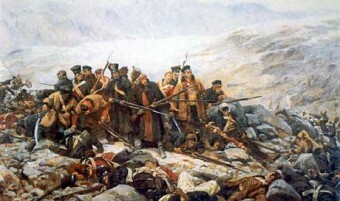 The next day, they made it the remaining way to the pass, but the Afghans had already secured it, armed of course with the British gunpowder and weaponry General Elphinstone had given them a few days before. By that night, around 2/3 of Elphinstone’s army lay dead, unable to penetrate the pass. Finally, Elphinstone and his second in command voluntarily left their troops and surrendered themselves (the General later died in captivity a few months later), though the surviving troops and followers that weren’t yet captured, continued on. Most of the others who chose to surrender, including women and children, were killed. The few who might fetch a ransom were simply taken back to Kabul and held captive. One group led by Thomas John Anguetil did manage to soldier on and made it as far as the small village of Gandamack, less than a day’s ride from the garrison at Jalalabad. During their journey from the pass to that village, the group took heavy casualties as they went and only about 20 officers and 45 other soldiers made it to Gandamack. As you might expect from them having made it this far without breaking, these soldiers weren’t quite so willing to surrender, even after they were surrounded and were given the chance; so the fight continued. Of those remaining 65 of the once 16,500 strong group, all but seven were killed at Gandamack. Six mounted troops manage to flee the scene after nightfall, with five of them killed before they reached Jalalabad. In the end, Dr. William Drydon manage to make it, being the first and one of the only ones who managed to do so (a few others managed to make it back, such as a Greek merchant and also a “Mr. Baness”, though Baness died the next day). By Drydon’s account, he and a Lieutenant were abandoned by the other officers, the officers having horses in better condition. The two then continued on alone before finally the Lieutenant chose to stop and hide until nightfall, even though they were just three miles from the garrison. Dr. Drydon thought it was better to keep moving, which he did and arrived at the garrison at around 1 P.M. on January the 13th. The Lieutenant never made it. Interestingly, Brydon’s life was actually saved by a paper magazine which he had stuffed in his hat to try to keep his head warm (it was extremely cold at the time, with heavy snowfall on the ground). At a certain point in his trek, an Afghan soldier swung a sword at him and it struck the magazine and rather than cleaving his whole head, the sword simply deflected and sheared part of Dr. Brydon’s skull. Still a none -to-pleasant injury, but not nearly as bad as it could have been. Obviously the British didn’t take kindly to this massacre and the rebels in Kabul soon were the victims of a massacre of their own when a British army lead by a competent General this time, William Nott, marched into Kabul shortly thereafter. All total around 50 hostages were rescued after the British army re-took Kabul, nearly all that was left of the 16,500 people that had attempted to flee that city.